When you think about wolverines, you might have a flash of the eponymous X-Men character, work boots or the University of Michigan mascot. Maybe this is because, in recent history, wolverines—the kind that kill and eat porcupines, squirrels and other small mammals—haven't had a known foothold in Utah. But wildlife officials in the Beehive State, motivated by a February 2014 wolverine sighting in the Uinta Mountains, are embarking this summer on an ambitious surveying effort along the rugged mountain range to discover whether or not wolverines—as well as the endangered lynx—truly do call Utah home. "I feel that it's important that we definitely need to expand our knowledge base," says Traci Allen, a Fish and Wildlife program manager for the Uinta-Wasatch-Cache National Forest. "I just want to know what animals are using the forest, how they're using it and what we need to do to protect the habitat." The estimated 300 or so wolverines in the United States live primarily in the northern Rocky Mountains and in the Cascade Range of the Pacific Northwest. The Uintas are fringe territory for the carnivores, but as the climate warms, scientists have been busy trying to determine how species that rely on cold, high elevation climes are faring. The Uintas, with multiple peaks stretching more than 13,000 feet into the sky, could become prime territory for the wolverine and the lynx. But gauging how prolific these elusive animals are in the Uintas—if there are any at all—won't be easy. The surveying efforts this summer are being conducted jointly with the U.S. Forest Service and the Montana-based organization Adventurers and Scientists for Conservation (ASC). With a $58,000 grant from the National Forest Foundation, 30 motion-sensor cameras will be placed in remote areas of the mountains. Wolverines and lynx—as well as bears and perhaps even wolves—will be lured to the camera sites with scent and food bait. Thirty-four volunteers will have the opportunity to hike 10 to 18 miles a few times during the summer to maintain the camera sites. Emily Stifler Wolfe, ASC marketing and outreach manager, says the 34 volunteers will work in pairs. Each pair will be assigned two camera sites, which they will check each month from July to September. The organization is currently recruiting volunteers and will offer training sessions in May and June, at which time the cameras will be placed. In addition to switching out memory cards and changing camera batteries each month, volunteers will spread new scent and replace bait. Because wolverines and lynx keep to themselves and roam remote areas, the use of cameras has proven to be more effective than other tracking methods. The 2014 sighting of a live wolverine, captured on one of five cameras previously placed in the Uintas, was the first of its kind in Utah. Prior to that, the only evidence of wolverine activity here was a carcass discovered in 1979. This sighting, while raising conservationists' hopes that wolverines are living in Utah, may also have played a role in the U.S. Fish and Wildlife Service's August 2014 decision to abandon efforts to protect the wolverine under the Endangered Species Act. While discovery of a robust wolverine population in Utah would provide further evidence that wolverines are not in need of more widespread protections, other surveys conducted by ASC have resulted in increased wildlife protections. 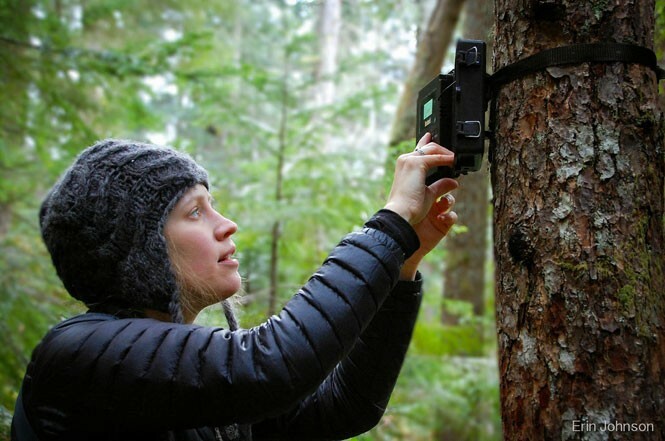 Wolfe says a 2013 survey on Washington's Olympic Peninsula, during which cameras failed to document any sightings of the Pacific coastal marten, resulted in expanded protections for that animal. Lynx, which are listed as a threatened species, are just as rare in Utah as wolverines. The fact that no one can say for certain whether or not these two species live in Utah shows that opportunities for discovery still exist in this world that becomes a bit less wild with the passing of each day. The Forest Service's Allen says she hopes this summer's survey is the first step in a multi-year process that will eventually show that the Uinta Mountains are home to these carnivores. Until that happens, the significance of what their presence means to the ecosystem, and how to best protect the habitat needed to sustain the animals' survival, are open books. "If we do find animals, what that would mean depends really on how they use the forest and where they're located," Allen says. For more information about the survey, visit AdventureScience.org.